Pulp fiction? : Mai Viet Phuong introduces his oranges, which he says help reduce belly fat. After working for years in Australia, Mai Viet Phuong came back to his native country to grow high-quality fruit. His Cara Cara oranges boast higher nutrient content than local options. Hoang Thien Nga reports. An orchard in the Central Highlands province of Lam Dong's Duc Trong District has provided jobs for dozens of locals since it was set up in 2001 by a Vietnamese expatriate from Australia. Seventy-two-year-old Mai Viet Phuong returned to Viet Nam after having worked in Australia as an agronomist and a lecturer at the University of Western Sydney. He is currently director of Phuong Mai Co Ltd in the area. Located at Voi (Elephant) Mountain, the orchard is filled with 50ha of rare fruit trees, mostly seedless citrus varieties. The orchard offers three species of seedless orange (Cara Cara, Navel, Tangelo), seedless limes (Tahiti), mandarins - and Bowen and R2E2 mangoes. Most of these were developed in Australia and are making their first appearance in Viet Nam. The star of the show, however, is clearly the Cara Cara seedless orange tree, the first of its kind in the world. It was created by Phuong and his co-workers over 30 years. "The Cara Cara oranges have an oval shape and navel that distinguish them easily from other orange varieties. When they are still unripe, they are green like other varieties, but when they ripen, their rinds have a striking mixture of green, yellow and pinkish hues," Phuong said. 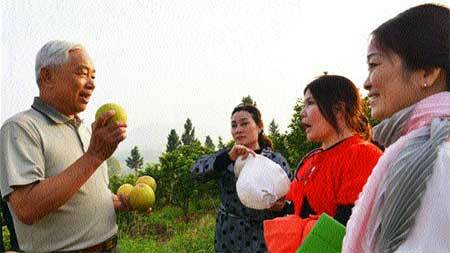 He said the Vitamin C and sugar contents in this kind of orange were much higher than in many locally grown varieties. "But the most special thing is that Cara Cara orange juice has the lycopene carotenoid which is said to have the potential to slow ageing, as well as prevent some types of cancer, particularly prostate, lung, cervix and skin cancers," Phuong said. Cara Cara oranges had their origins in Venezuela in the late seventies, reached the United States in the eighties and were later brought into Australia by Dr Graeme Richards, lecturer at the Hawkesbury University in Australia, according to the agronomist. "Since becoming an agronomist, I have dreamt of creating new high yield, quality fruit varieties for Viet Nam that are easy to grow," Phuong said. "I found that many Vietnamese fruit varieties show signs of degenerating, but we have not developed many new ones to replace them. I hope the new varieties will help Vietnamese farmers improve their incomes." Since the Cara Cara oranges should develop well in Viet Nam's soil and weather conditions, he asked Richards to allow him to plant the variety here. 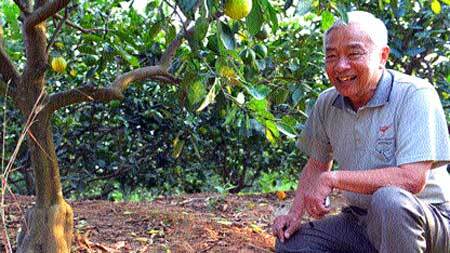 "Dr Richards was ready to help me set up a Cara Cara orchard in Viet Nam. In fact, all the saplings, cuttings and tissues that I have used for growing Cara Cara trees in my orchard come from his farm," Phuong said. But developing Vietnamese interest took the agronomist nearly 20 years. "More than 20 years ago, I introduced the Cara Cara to Viet Nam by sending seedlings to some research institutes. However, they did not capture their interest," Phuong said. But he did not give up. In 2000, he decided to return and began growing Cara Cara and many other citrus fruit varieties here. Phuong at first chose the Cuu Long (Mekong) Delta for a pilot orchard, because the region had highly fertile land. However, he failed to find a plot of land large enough for his purpose. His friends then suggested that he try the Central Highlands, as it was thinly populated. Phuong decided to begin his work there, even though the land was not as fertile as in the delta. "In 2001, I rented a 10ha land plot on Voi Mountain from the Tan Mai Paper Company. I used three ha for growing the Cara Cara oranges and the remainder for trial farming of nearly a dozen other plant species," Phuong said. "The land was infertile, and 50 per cent of it was covered with rocks and gravels. This made me more determined to grow my new citrus species there. I thought that if I succeeded in growing them there, they would grow anywhere," Phuong said. The director and his employees had to dig out the rocks from the land, sometimes removing six to seven stones from a single spot. He also spent about VND20 billion (US$1.1 million) building electricity and irrigation systems including reservoirs on the mountainside to water the garden. Several years after the venture kicked off, the orchard begun to bear fruit. Phuong has also built a nursery for seedlings on an area of 4,000sq.m. "On each hectare, we have planted about 400 trees. Although they are just four or five years old, they have an annual productivity of 35 tonnes per ha. The yield will rise to 40 tonnes when the trees reach maturity," Phuong said. While domestic orange trees have a life span of between 10 and 15 years, the Cara Cara trees will last for 40 to 50 years, according to Phuong. "Thanks to its vitality and high pest resistance, the variety requires only modest care from growers, saving them time and money," he said. "Significantly, this variety bears fruit all year round. They sell for between VND20,000-40,000 ($1 to 2) per kilogramme. This will enable growers to earn money all year round and also help them avoid losses created by the peak-season phenomenon."